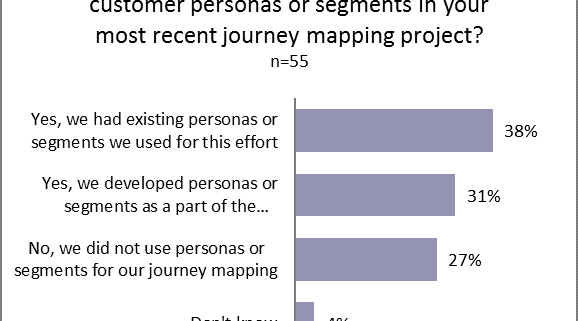 O ne unforeseen result from our journey mapping best practices survey was that a surprising number of practitioners – almost one-third – do not use segments or personas in their journey maps. If you don’t use personas in your maps, then you probably don’t design around specific types of customers. And that’s a real risk. Because customers are different. And if you’re not using personas to capture those differences to design your experiences, it’s likely that you’re missing some important nuances in your experience design. Let’s first define personas. A persona is an archetype of a set of customers. They can be defined by demographics – but that’s a bad way to do it. Using a demographics-based definition will get you in trouble, because these will only show surface differences – not the distinctions that matter. For instance, despite what you may read, not all Millennials want the same experience. Similarly, many B2B companies have gotten confused about what a persona really is, and they use job roles as a stand-in for personas. While you may not believe it, not all IT Managers think the same. If you’re using personas to mean job titles, you’re certainly creating generalities that end up not really mattering. Best-in-class personas are defined by attitudinal and/or behavioral differences. That’s where you start. Once you discover how your customers vary by how they think or what they do, then you can look at the demographics to help you identify them. But you need to do it in this order, to make sure that the differences you’re highlighting truly matter. Most of our clients won’t let us publish their personas for competitive reasons. But one who does is Meridian Health. Their case study was published in the book Mapping Experiences, so we can discuss it here. We wanted to understand the points of friction in advanced radiology (MRIs, CT Scans, Ultrasounds) from scheduling through the results. Had we started with demographics, we would have selected two types based on age – Baby Boomers and Generation X patients. Instead, we looked at attitudinal differences, and discovered three personas. One, Newbie Natalie, represented many Gen X-ers. Natalie is new to this procedure. As a result, the journey confuses her. She doesn’t know what to expect. So her needs are centered around clearer communication to set appropriate expectations, and preview what’s ahead in her journey. We discovered two separate Baby Boomer personas, which were very different. Seen-It-All Stanley loves Meridian – he uses their health system for everything. As a result, he trusts the system, and his history with them gives him a good idea of what to expect. When something goes wrong, he trusts them to make it right. His primary need is for reassurance and confirmation that he’s made the right choice. High-Maintenance Holly, in contrast, has high anxiety. She’s been through a number of doctors and hospitals, and her trust is low. She doesn’t believe any health system is on her side. The little bumps in the road that Stanley takes in stride rattle her. Even though she has more experience and knowledge than Natalie does, she still needs to have her expectations clearly set. Her anxiety makes her forget details, and makes her fragile. The small talk that Stanley enjoys drives her crazy – she needs her communication to be specific and substantive. Imagine if Meridian tried to design their experience using demographic-based personas – or, even worse, no personas at all! Stanley and Holly would have been combined to create a miserable mishmash of mediocrity. And Meridian would not have had the clear direction they needed to improve their experience. 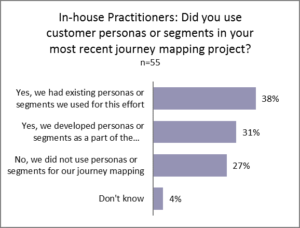 You don’t necessarily need to create the personas in your journey mapping process. 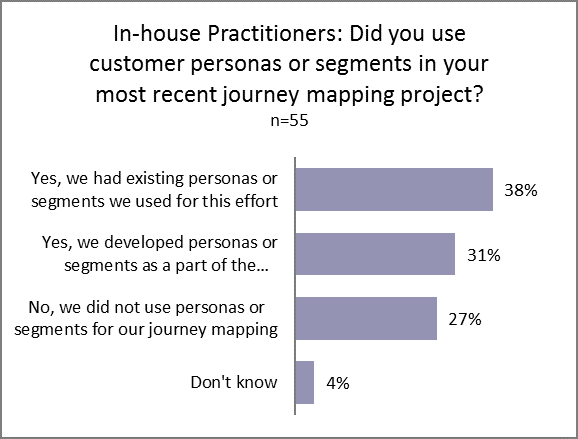 If you already have personas or segments, then by all means use them, as 38% of our survey respondents did. This will make it easier to communicate the experience, and those redesigning your experience should already be familiar with them. There are times when it doesn’t make sense to use personas for your journey mapping. For example, when we studied the top ten home builders, personas made no sense. But we’ve frequently used personas in B2B. Creating personas does, however, require a sufficient sample size to identify the different attitudes or behaviors. 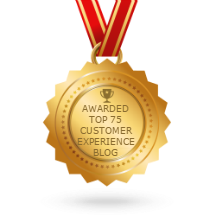 Customer experience is personal. Your design work (and the journey map it’s based on) needs to reflect that personal touch. Personas are the best way to bring those personal needs to life. I bought the book and it’s really useful – recommended.